With a width of 12ft 7in (3.84m), the Robinsons Regal is available in any length starting from 8ft 8in (2.6m) and continuing upwards in increments of 2ft (0.6m), to accomodate any gardeners growing needs. 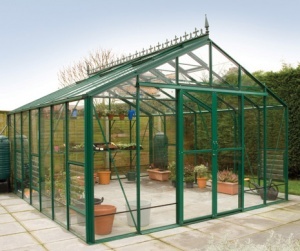 Given the size of this greenhouse, the frame has been specially stiffened with additional bracing and internal 'A' frames. Ridge and eaves braces are applied to every set of glazing bars and extra structural rigidity has been added to the door gable. Add this to a continuous concrete or brick perimeter footing (which is necessary for a greenhouse of this size) and you have an exceptionally strong and durable building. The double doors give a 4ft (1220mm) wide opening and are a particularly useful feature of this model - they slide easily, are lockable, and provide easy access over the ground level threshold - ideal for wheelbarrows and wheelchairs.